Components were becoming larger and more geometrically complex, and there was a shortfall in machining capacity. A Hermle C 20 U vertical machining centre with full 5-axis capability was installed. Supplied by Kingsbury, UK agent for the German machine builder, the machine increased to 600 x 450 x 450 mm the size of component that can be machined at the university to tolerances measured in single-digit microns, despite the use of fully interpolated 5-axis cycles. One series of tasks that the machine regularly undertakes is machining of scale models of turbine blades and other aero engine parts for testing. To achieve the required precision during metal-cutting and subsequent component inspection, the C 20 U resides in a temperature controlled room alongside a coordinate measuring machine. The university ordered a well specified C 20 U at the outset, as machine function is paramount when investing in new plant to ensure that it can carry out the widest possible range of applications. 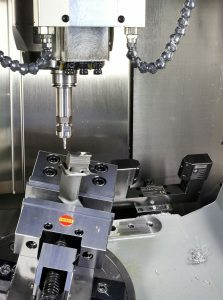 A 40,000 rpm spindle was chosen, as the machine operates at 20,000 to 30,000 rpm for long periods and has been run at top speed on several occasions. Swarf management options were included as well as coolant filtration. A BLUM LaserControl Micro Compact unit provides non-contact tool setting and monitoring, and a high-speed camera captures real-time images from the machining area for subsequent analysis. A research coordinator at the University.